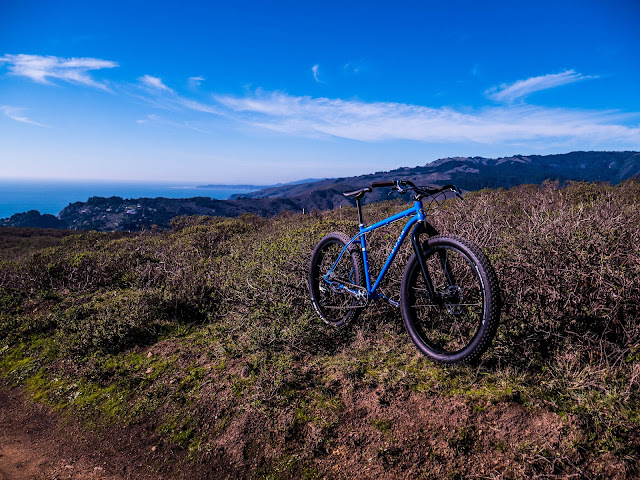 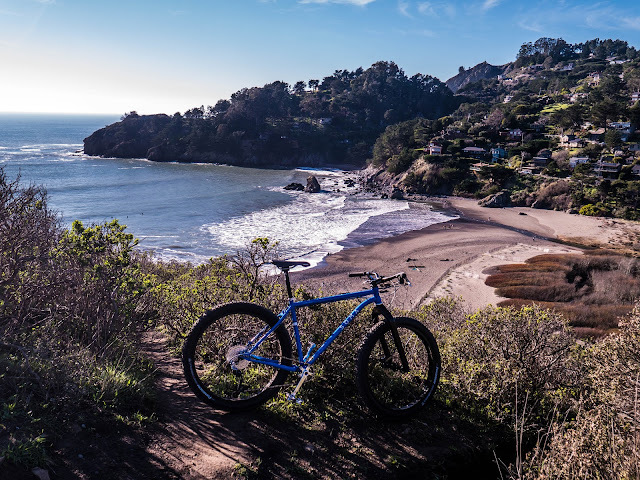 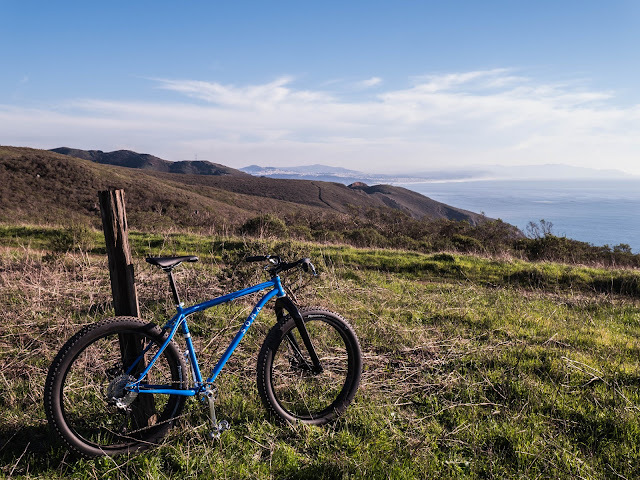 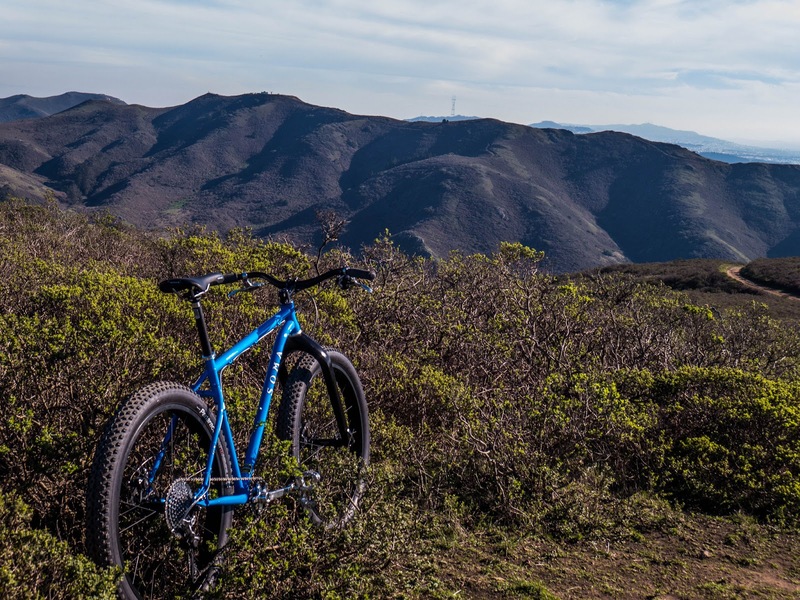 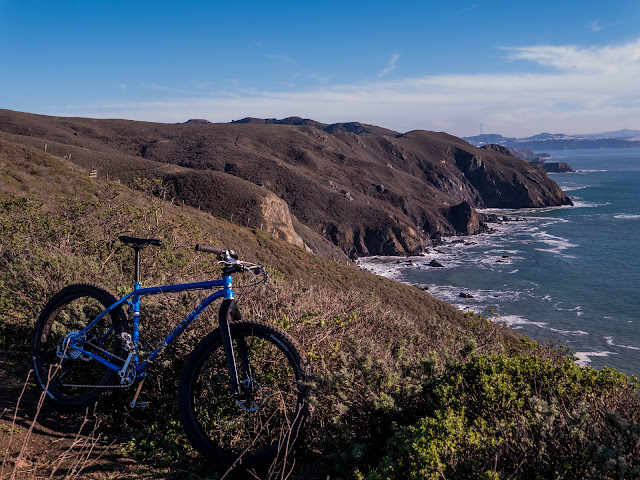 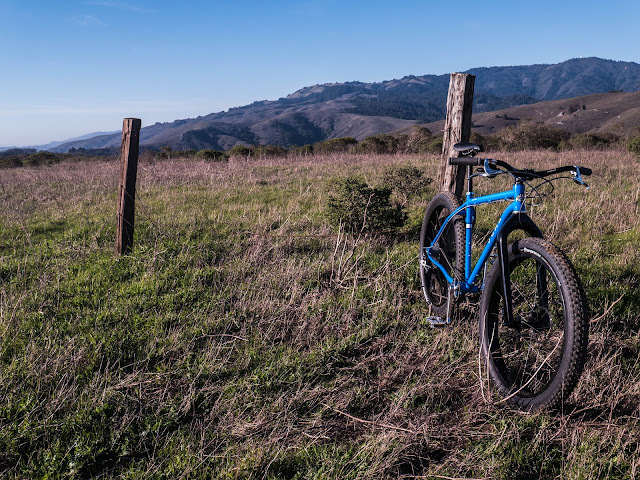 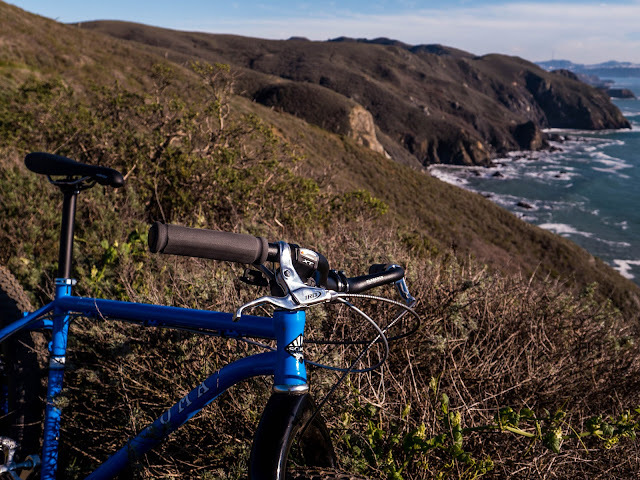 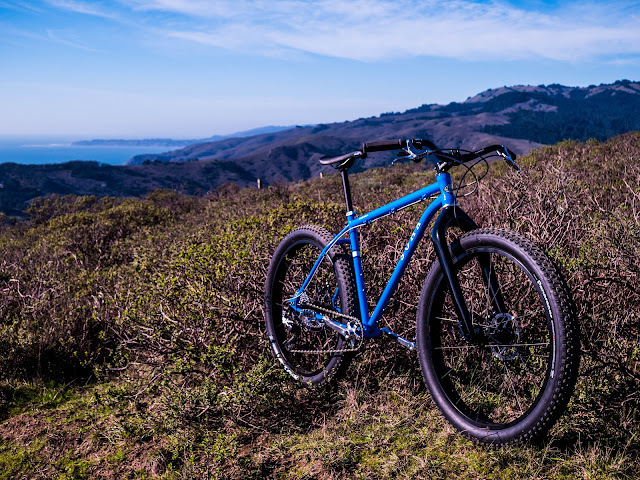 We had a little break from the rain this week, so I took the B+ Sandworm out to Marin to play in the mountains before it started up again. Here's some photos from the ride. 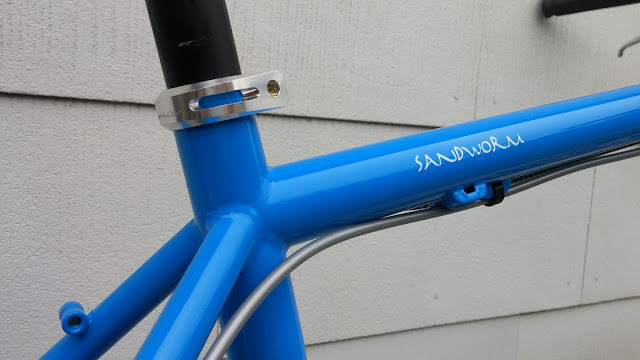 It's been a long, long time coming, but the mythical Sandworms have finally emerged from the bled to take their rightful place at the top of the food chain. 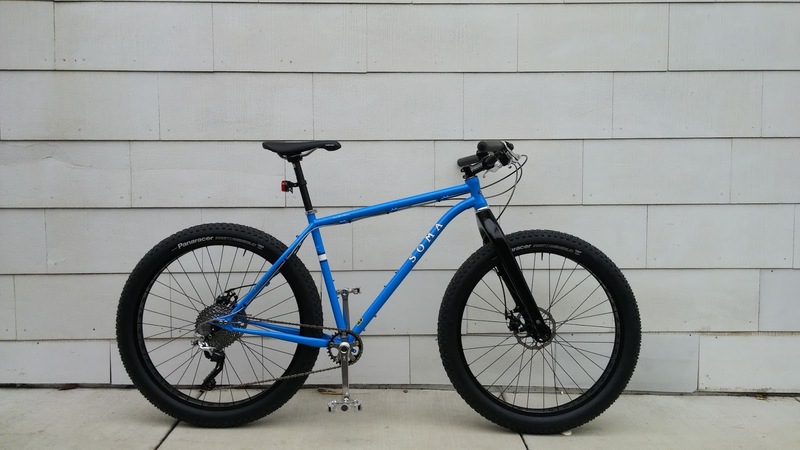 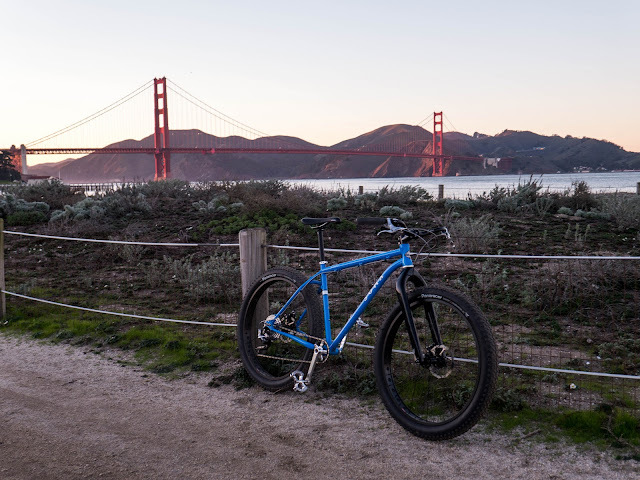 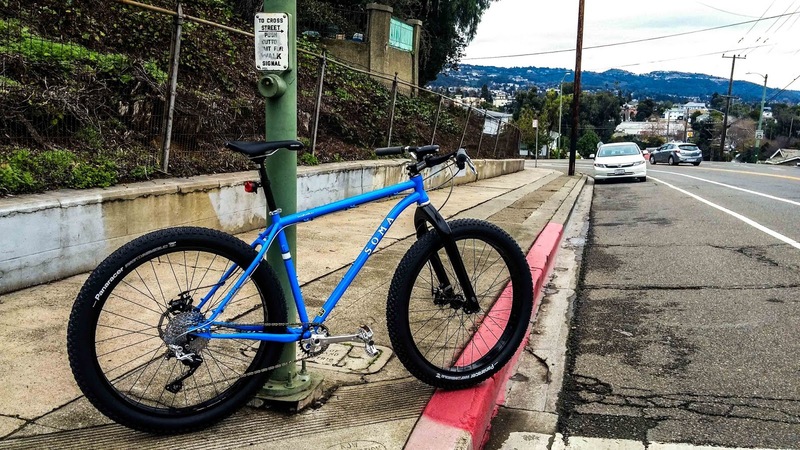 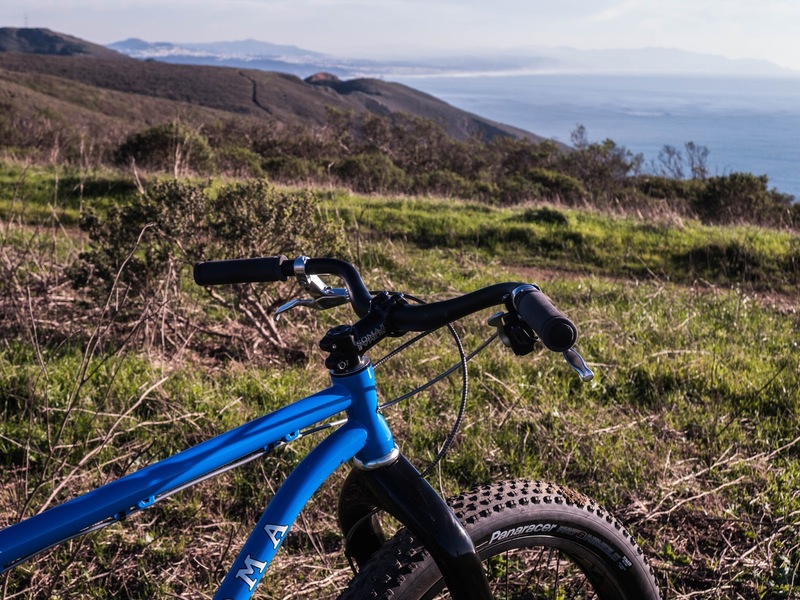 We built this one up with 650b wheels and 3" tires for a more "lively" trail oriented ride. 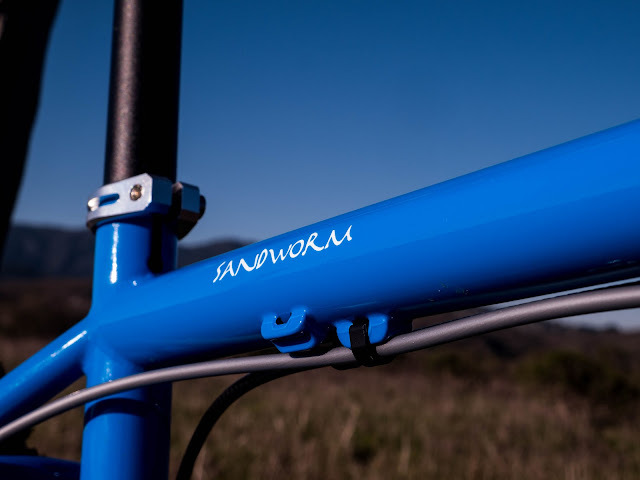 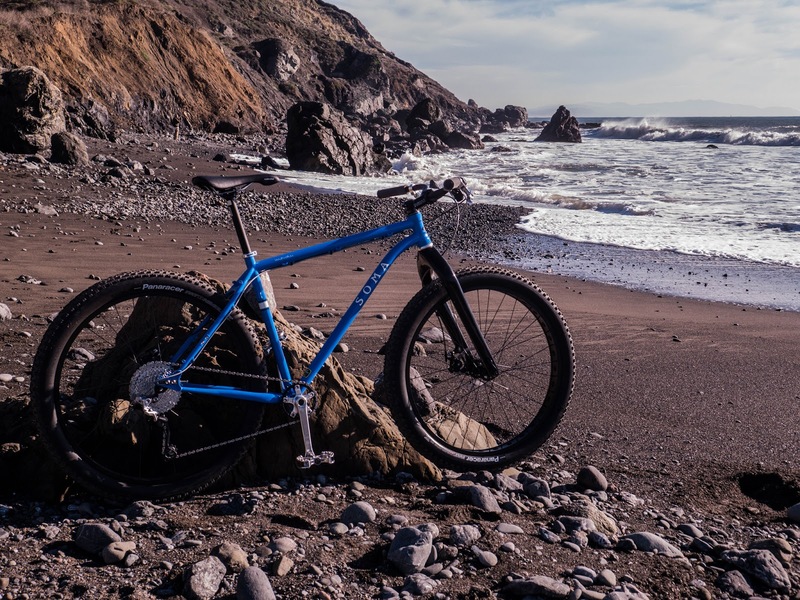 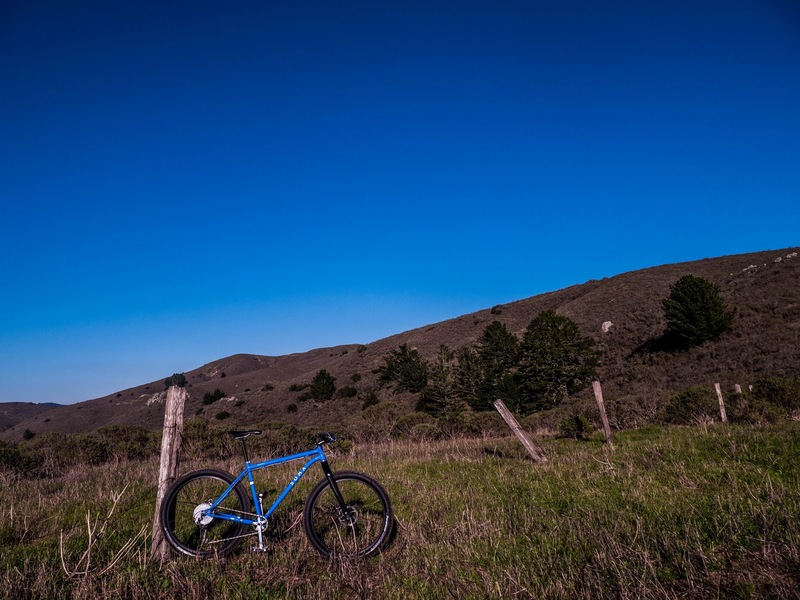 The Sandworm is made with sturdy Tange Infinity tubing, making it stiffer than the other Soma MTB frames. 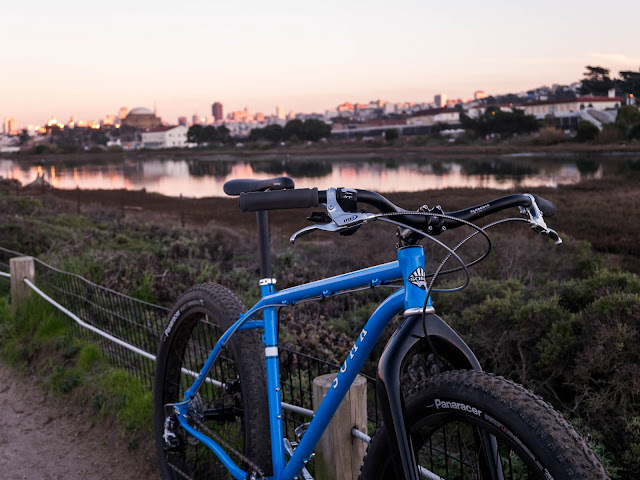 With tires this wide you don't need the frame to dampen the ride much, so we built it for loaded bike packing and rowdier Enduro routes. 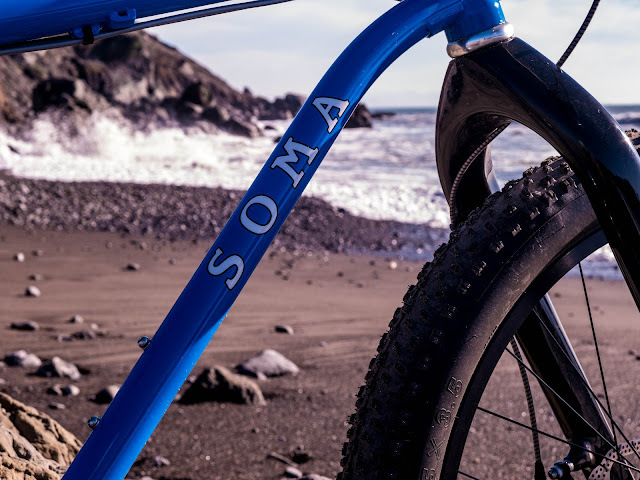 Like several other Soma models, the Sandworms feature a splitter for installing a carbon belt drive. 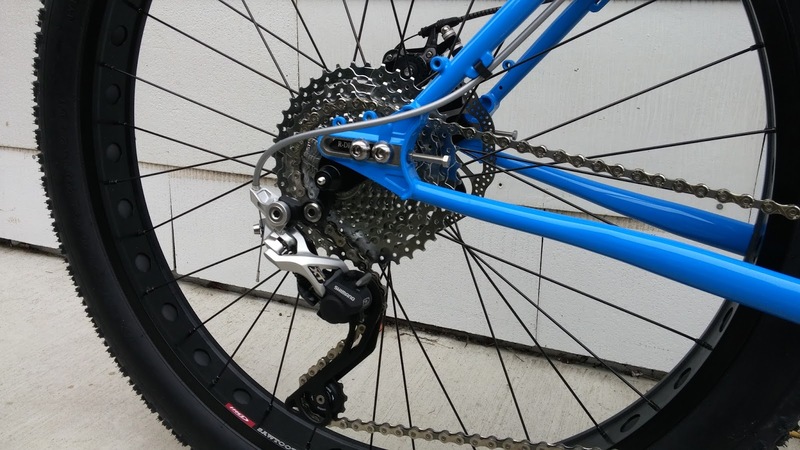 Originally designed as a single speed crankset, more people have been using these IRD Mjolnir cranks on 1X drivetrains. 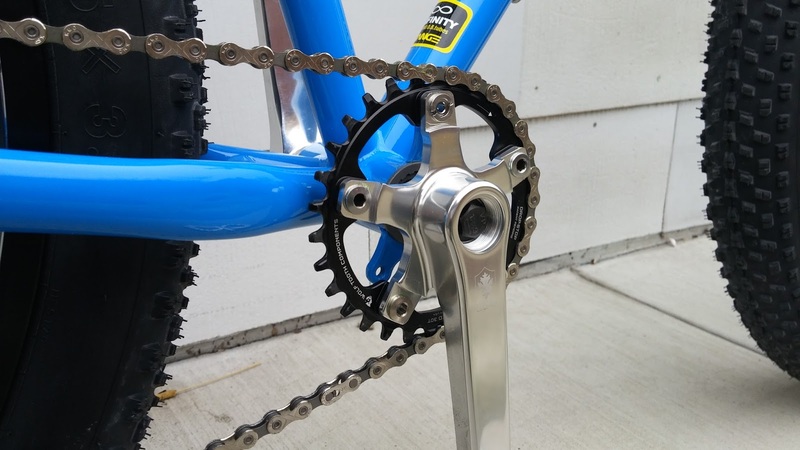 Since the cranks arms need a bit more clearance to wrap around the wider chainstays, we used the Wolf Tooth 94mm offset chainrings to achieve a perfect chain line. Since it's a square taper design, it offers more flexibility for unusual chain lines such as you'll often find on internal gear hubs. 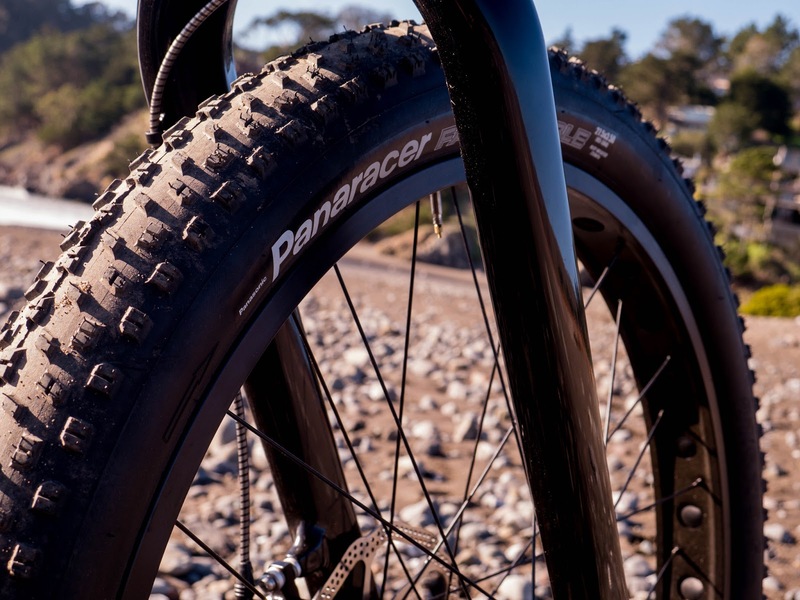 The outer diameter of these wheels is about the same as the 26" fatbike tires that are popular for softer terrain and snow. 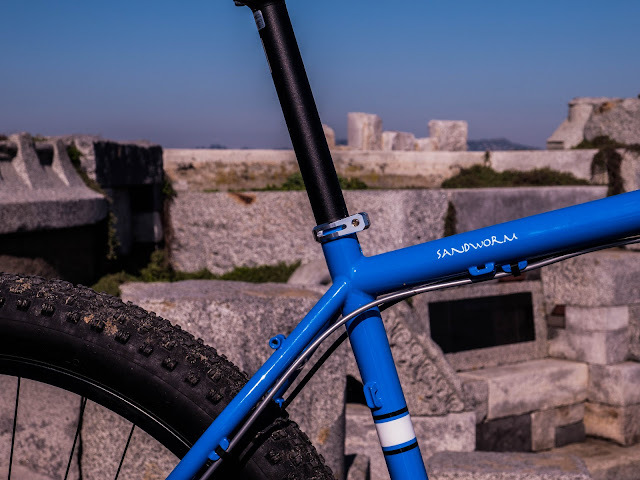 This allows the frame to accommodate multiple wheel set if you want to change up your riding style. This carbon fork offer plenty of clearance for even wider tires. 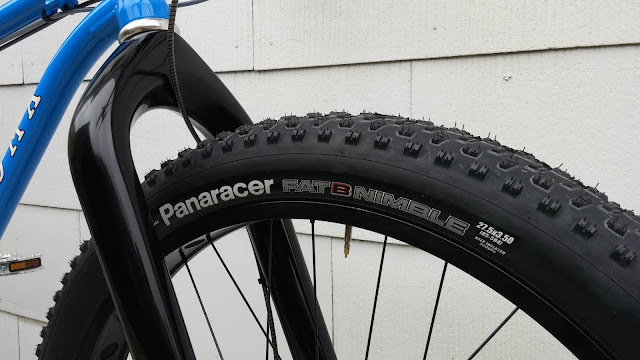 The 55mm IRD Sawtooth 650B+ rims really take advantage of the Panaracer Fat B Nimble's added volume, giving the tires a wider contact patch and better cornering performance. 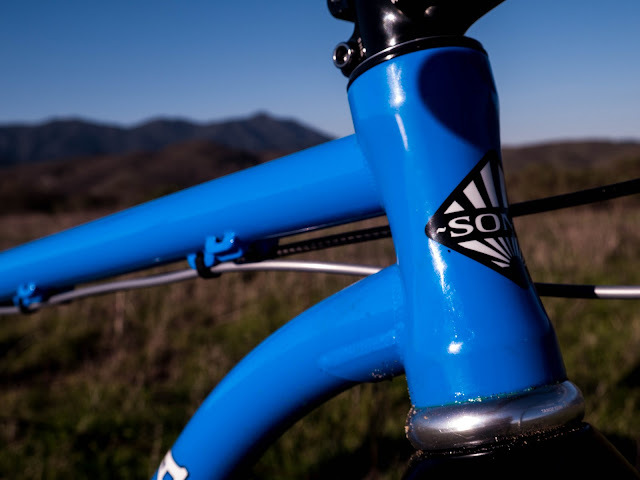 The hourglass headtubes allow you to run both tapered forks, or straight steerers. 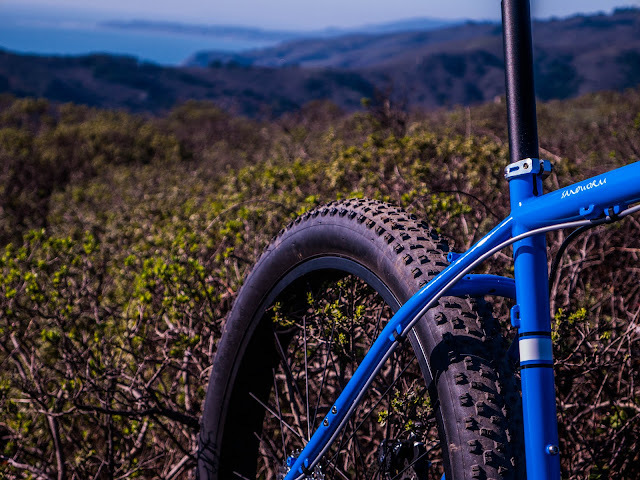 Even though we began developing this bike before there were any true fatbike suspension forks on the market, we knew that we wanted to make sure it would accommodate them when the fork makers finally caught up. 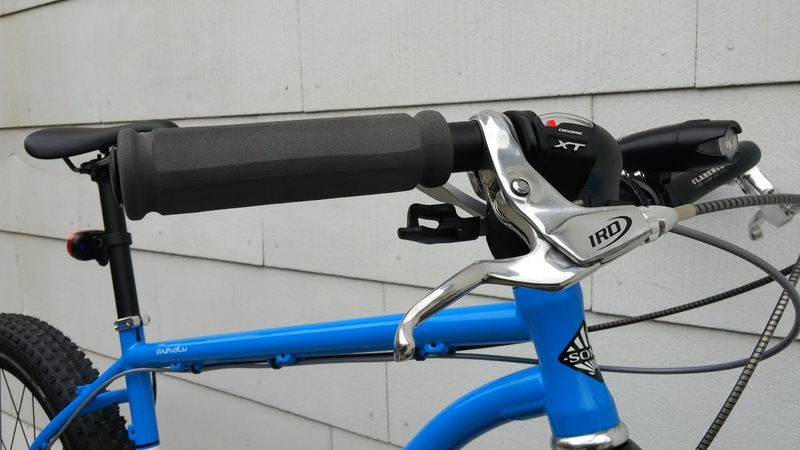 For the cockpit we used my favorite MTB bars the Soma Clarence and a Soma Shotwell 31.8mm stem with Palma Sutra foam grips. 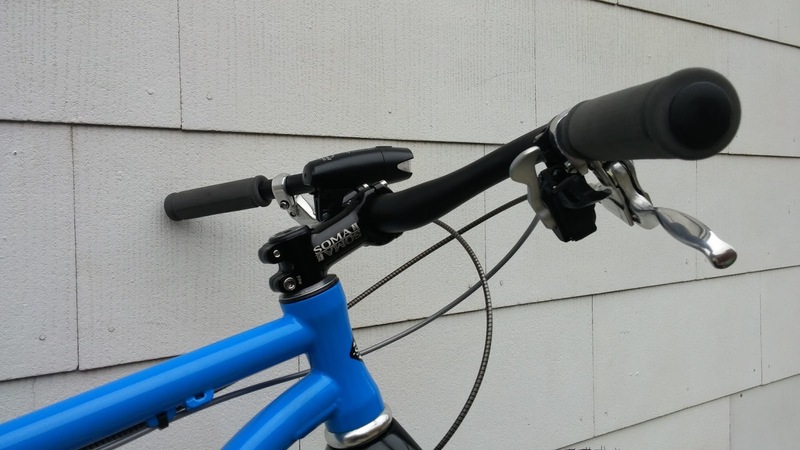 In addition to enabling single speed and Rohloff compatibility, the IRD sliding dropouts allow you to adjust the effective chain stay length to suit your riding style and tire choice. There are so many fat tires on the market these days that we haven't had a chance to test them all, but we have yet to encounter any that don't clear it's curvy stays. 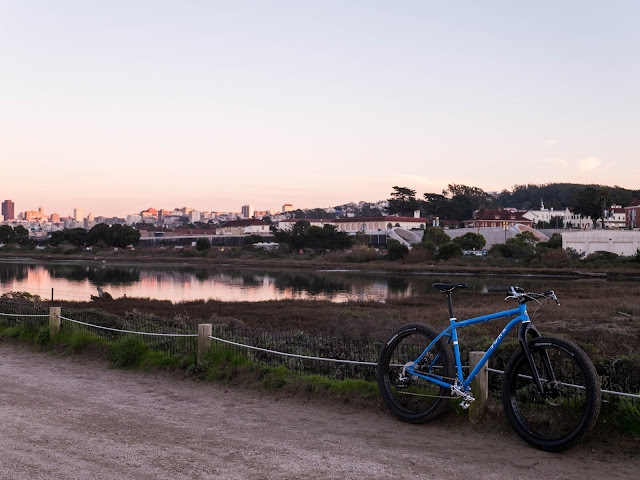 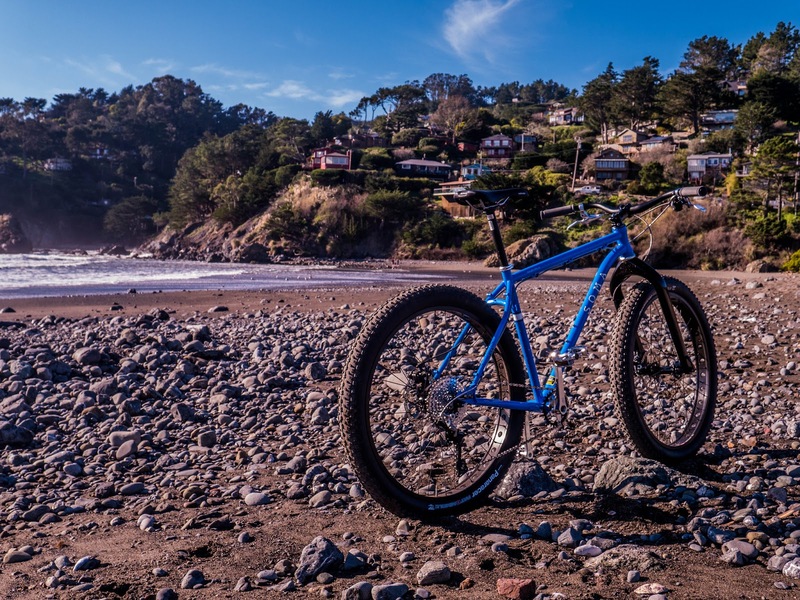 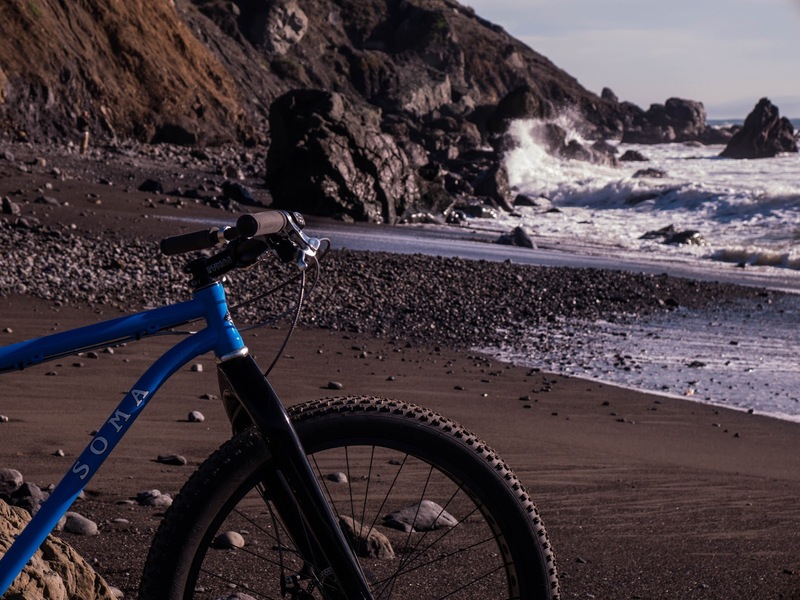 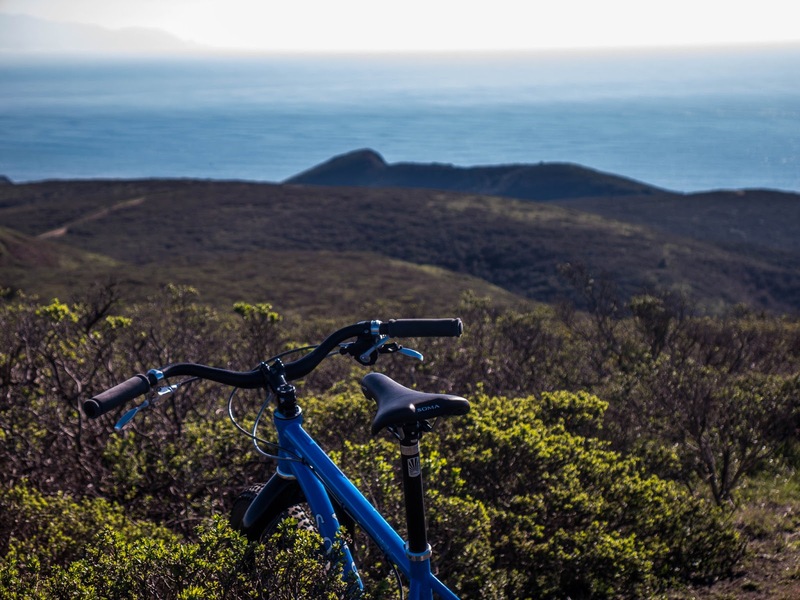 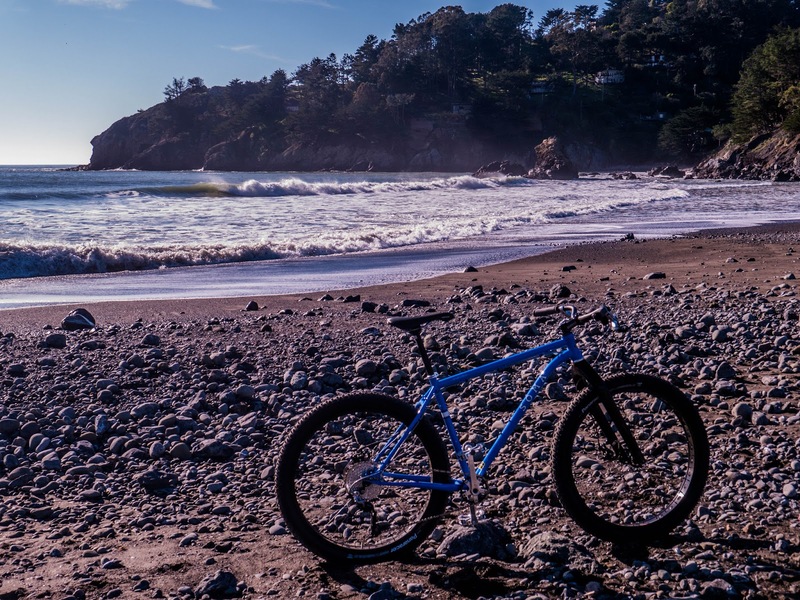 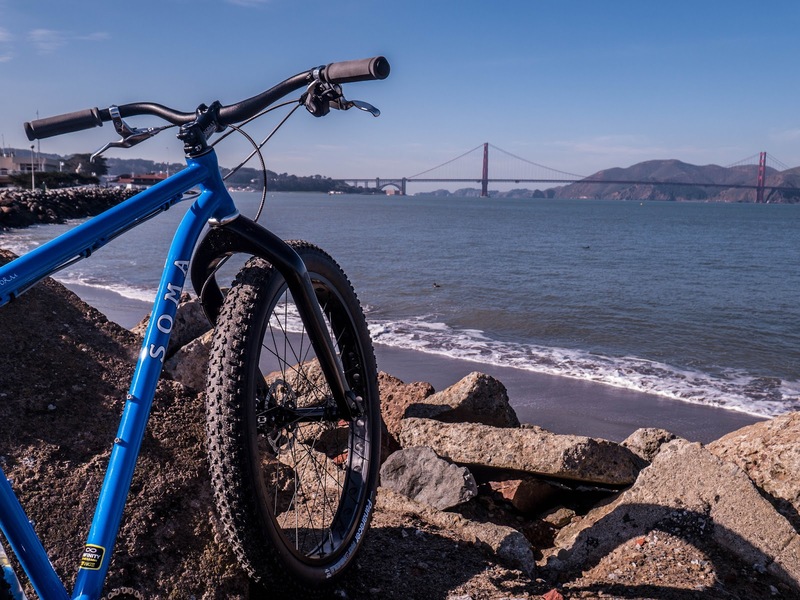 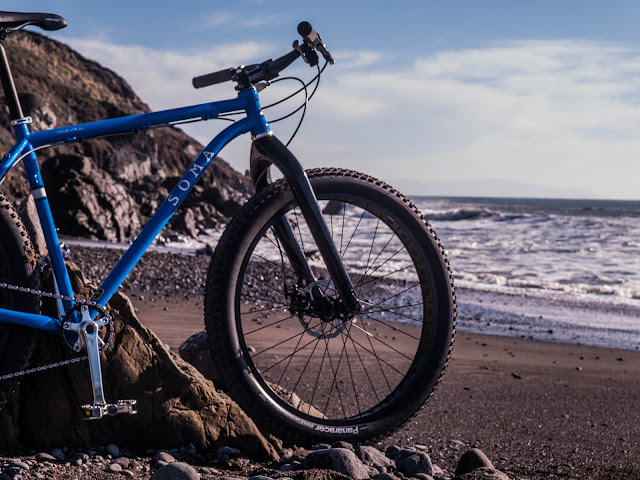 Weather you're building up your first fat bike or swapping out a old one, we think the Sandworm offers a great feature set which allows you to build it the way you want. 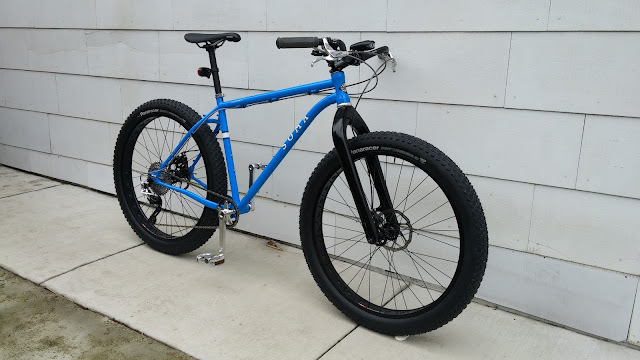 I mounted up a set of 33c Supple Vitesse SL tires on Pacenti CL25 rims to try them out on some local trails. 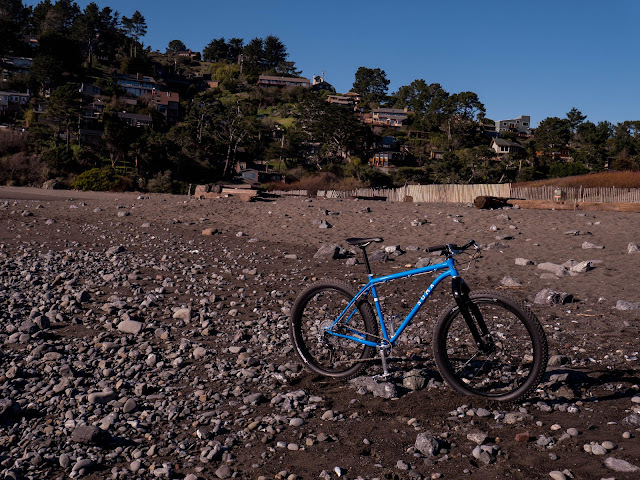 While they're not the most aggressive tires for offroad riding, the grippy Japanese rubber compound and ultralight casing make them extremely fast rolling on hardpack and slick rock surfaces. 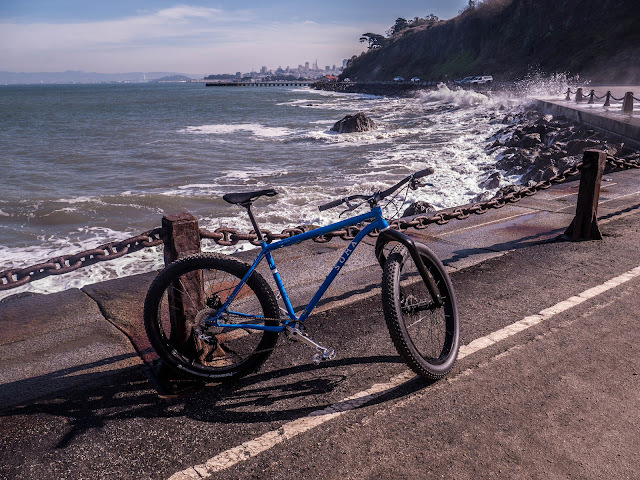 33mm is a bit narrower that what I normally ride offroad, but for a bike that stays primarily on the road its a good size. 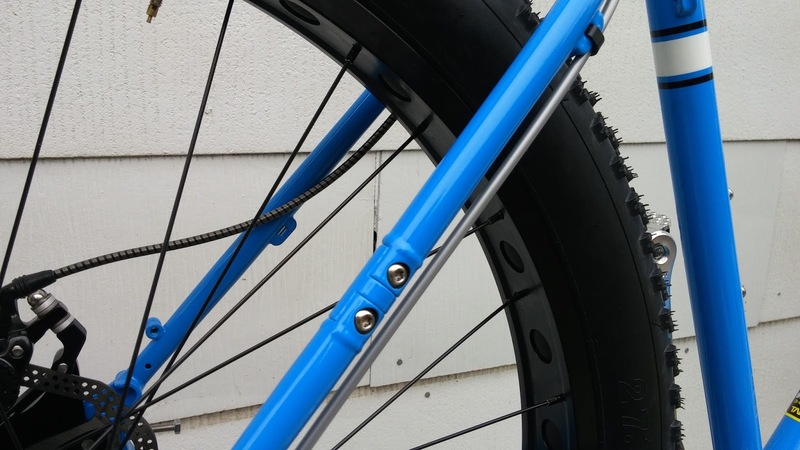 The Supple Vitesse has the advantage of a recessed file tread pattern, which doesn't pick small peices of rock and other debris like many retro tread patterns. 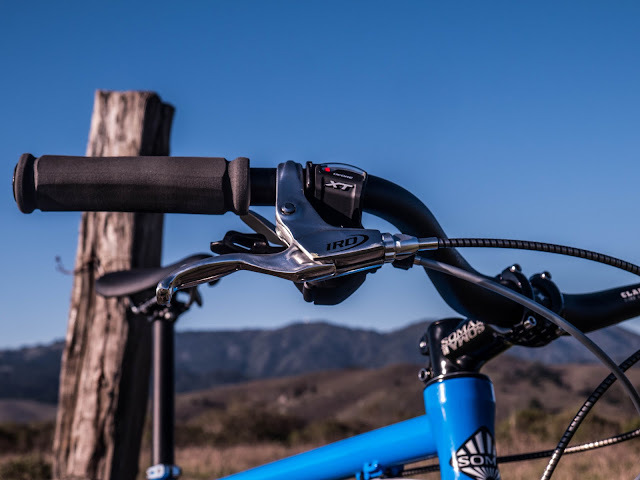 The ribbed sections make the rubber softer and allow it more purchase on uneven surfaces, but due to the support provided by the solid areas they don't add much drag when in contact with smooth roads. 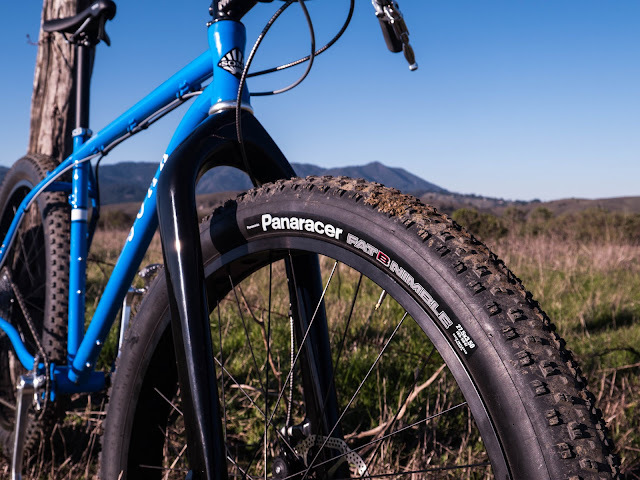 We've found that most tires perform better when paired with a rim that opens the casing up a bit. 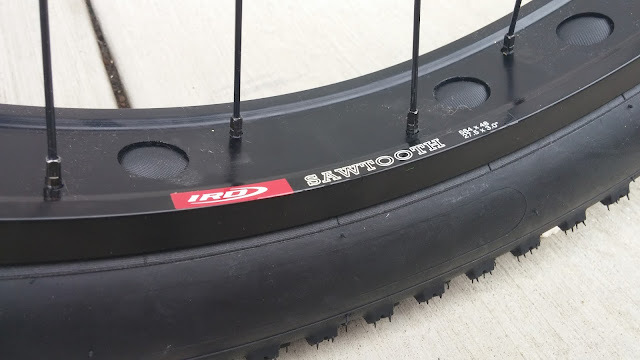 These Pacenti's are just about perfect for this tire. 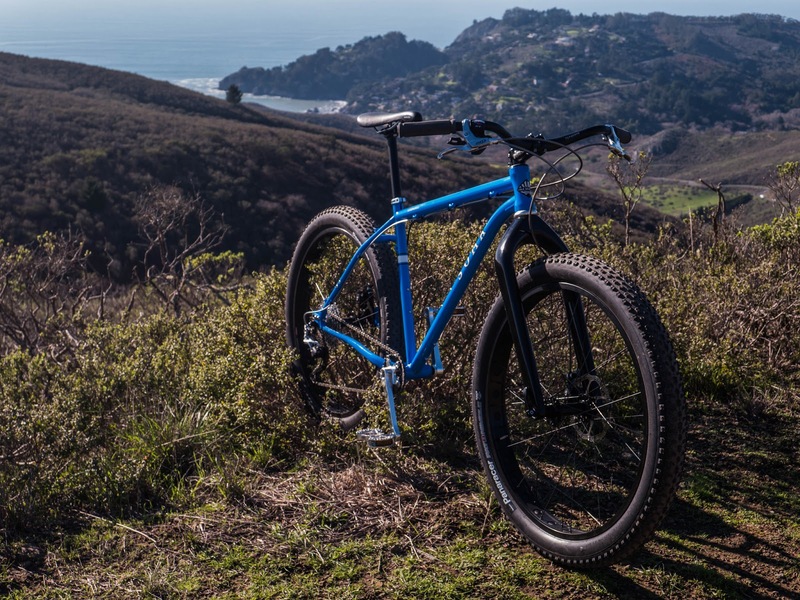 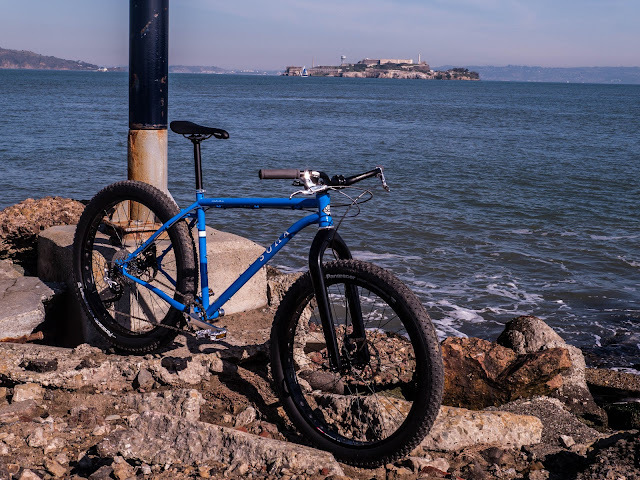 In case you were wondering, this bike is an early prototype of the Rawland Ravn, which is designed around 26" or 650b wheels. Luckily, since it has disc brakes it's possible to experiment with these 700c wheels as well. 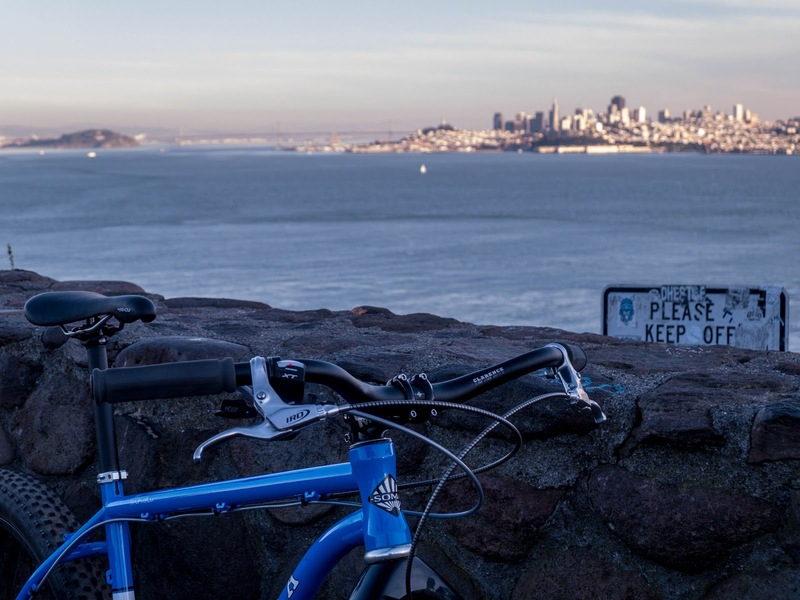 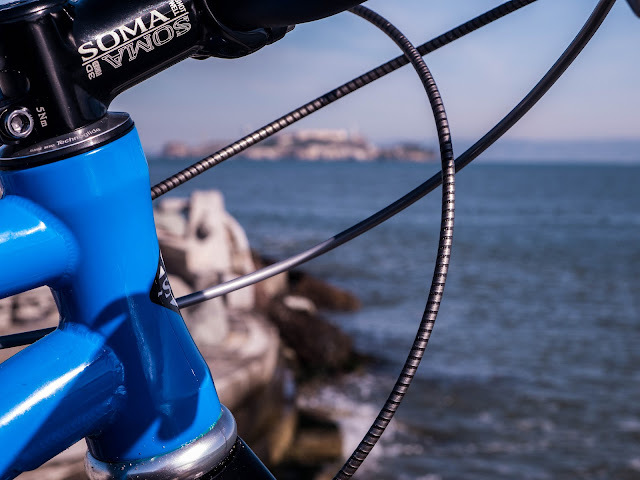 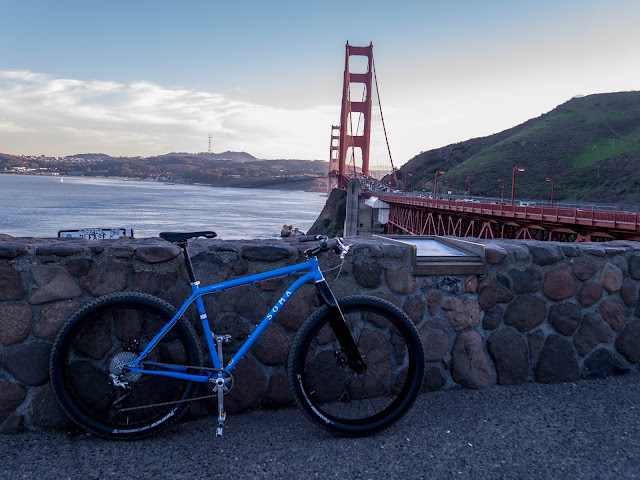 The front rack is a Soma Champs Élysées stainless steel mini rack, which mounts to the Nitto standard hourglass eyelets on the front of the fork blades.